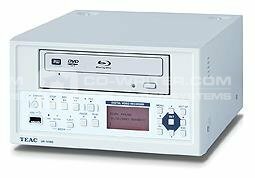 Real-Time Direct Recording to Removable Media (Blu-Ray/DVD, USB Flash, USB Hard Drive, etc. All-in-One Unit with No PC Required. High-Resolution Data Archiving via DVI (& HDMI). Hard Disk Drive (HDD) Embedded for the Data Backup. The Backed-Up Data (50GB x 2) on HDD Inside Can Be Retrieved to Removable Media for the Inexpensive (Digital File) Distribution of the Patient Study and Report. Recorded Data to Removable Media is STB and PC Compatible. Front Panel USB Port Provides Easy Access for USB Memory/USB HDD. RS-232C and USB Control. TEAC . - . UR-50BD . High-Definition . Medical . Image . Recorder .